By now, we've all heard of ombre, balayage, and sombre. While these colors are still trending and beautiful, there's a new look that has been all the rage for quite some time now...Babylights!! Babylights are strategic, finely placed highlights, mimicking the look of a babies hair, aka: natural, subtle and youthful. It creates the perfect, sun kissed result for any hair color! 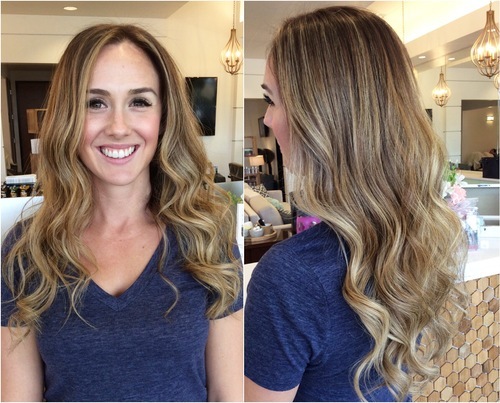 Ask your stylist to go a couple shades lighter than what you are now to get this look without a huge commitment. It also allows for longevity between appointments because you don't see the line of demarcation you get from traditional "heavier" placed highlights. Check out these beautiful before and afters! Alison had grown out her natural color, and had quite a bit of blonde left on the ends of the hair. To get this look, I did a full highlight, but wove each individual highlight much finer than I normally would with a traditional highlight. You can see the very fine shimmers of highlights in the above picture on the right, along with the perfectly placed face framing highlights. I was very strategic in where I would place each highlight, placing more blonde around the face, and making it brighter on the ends of the hair while still adding lightness throughout the entire head. 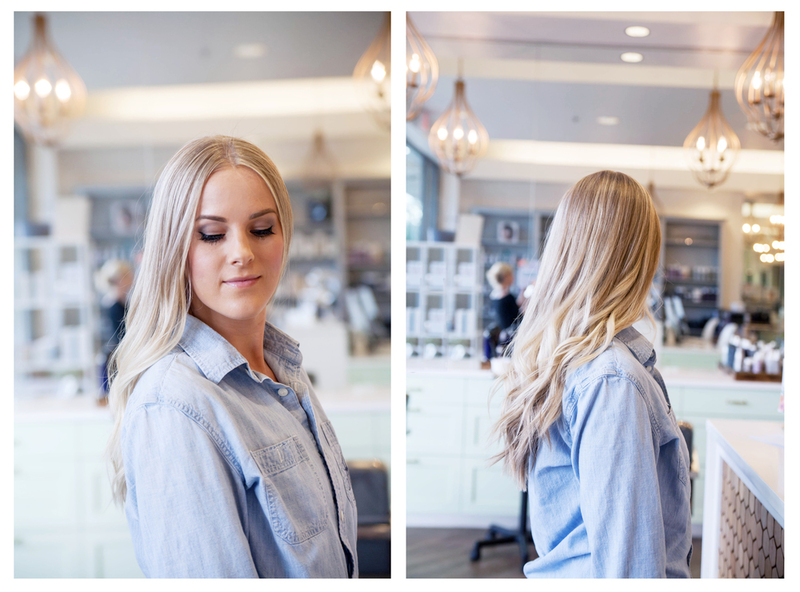 After highlighting, I applied two different customized glaze formulas, one at the root for a softened "shadow" effect that was slightly darker than her bright blonde ends. And then for the ends of the hair I used one my favorite ash glaze formulas. Each foil, highlight color, and glaze formula was customized to her skin tone, natural color, and existing color while keeping longevity in mind as our main concern. 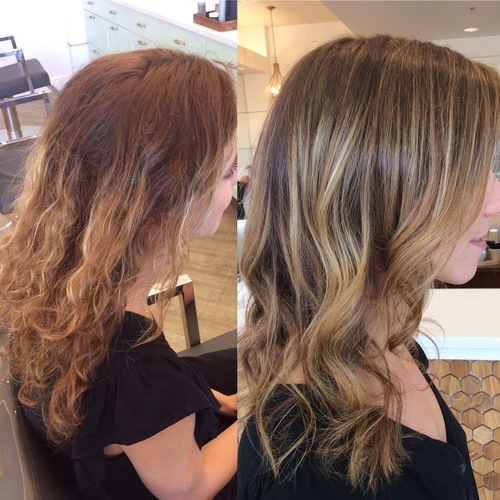 As you can see from the pictures below, Alison was able to achieve a much brighter look, while still placing finely placed shimmers of highlights throughout the entire head. 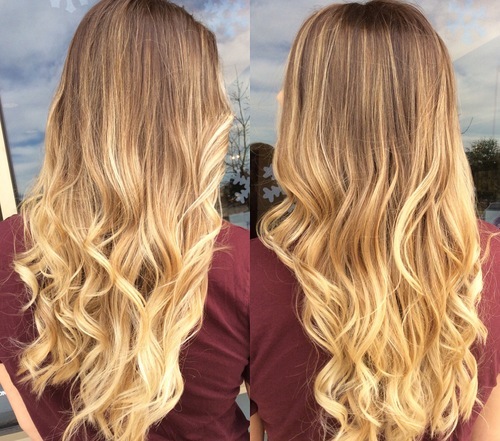 Since the highlights were woven so finely and the glaze is slightly darker at the root, Alison will be able to go 10-12 weeks between appointments instead of 6-8 like a traditional highlighting technique would require, which is a huge plus for this busy blogging mom! Essentially any hair color can achieve this look! Blondes will want to stay bright, buttery and natural. For brunettes, ask for golden, beige or bronze ribbons of color. Darker shades will want to stay more "tone on tone' with warmer shades close to their existing color. Redheads should be coppery or golden to brighten up their look. You basically want to stay soft and natural within a couple levels of your natural color. While this process sounds simple, it is actually very time consuming and requires an advanced stylist that knows their stuff! I typically book out more time for Babylights than I do with a traditional highlight or balayage service because it is so strategic and the sections are so much finer than normal. Here are some more examples of babylights!